My first impression is that it's pprreeettttyyy. And that the dust jacket is not practical and tears easily. Beware. It's great, best book I've read in a while (only 6 chapters in so far). I started 1Q84, I'm about 50 pages in and so far it's a great book. But, just in case you read Twilight already there are also The Bean Trees by Barbara Kingsolver (I think it was her first - not sure though), Waiting to Exhale by Terry McMillan and The Blessing Way by Tony Hillerman. The only book I've read set in Phoenix is "Waiting to Exhale" by Terry McMillan. 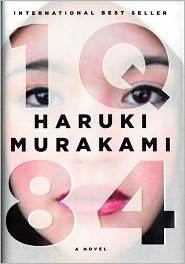 I started to read 1Q84 on my Kindle, otherwise it is such a heavy book it would be difficult to bring with me in my purse. I am on page 145 ( on kindle there is no page so I have to figure the % which amounts to 145p) I absolutely love it, can't put it down. From searching other blogs who are reading this novel, many have switched to Nook or Kindle even so they bought the book. @Amanda - That is my exact first impression, too. It will be one of the very few hardcovers I read for which I remove the dustjacket while reading. But, it is still pretty friggin' cool. @Mooderino - Well, that's encouraging! @wordsandpeace - I preordered it weeks ago, so the library didn't cross my mind. And I'm encouraged to hear you're enjoying it. Hope it stays enjoyable for all 944 pages! @Man - Twilight: Well, I suppose there's a reason that one didn't spring immediately to mind. ;) Thanks for the other ones, too - hadn't read any of them, but they are good calls. @Anonymous - Good one - thanks. @Madeleine - Another ringing endorsement for 1Q84 - can't wait to read it. My copy finally did arrive on Saturday. I'm finishing up 1984 and then diving in! I'm reading 1Q84 on my Kindle as I didn't want to lug the paper book around. The book's a mix of fantasy and social commentary?